My earlier post today about fly tying weekends at my family cabin was partly occupied with my diligent work on these flies. This is the Carrie Stevens pattern – Shang’s Favorite. 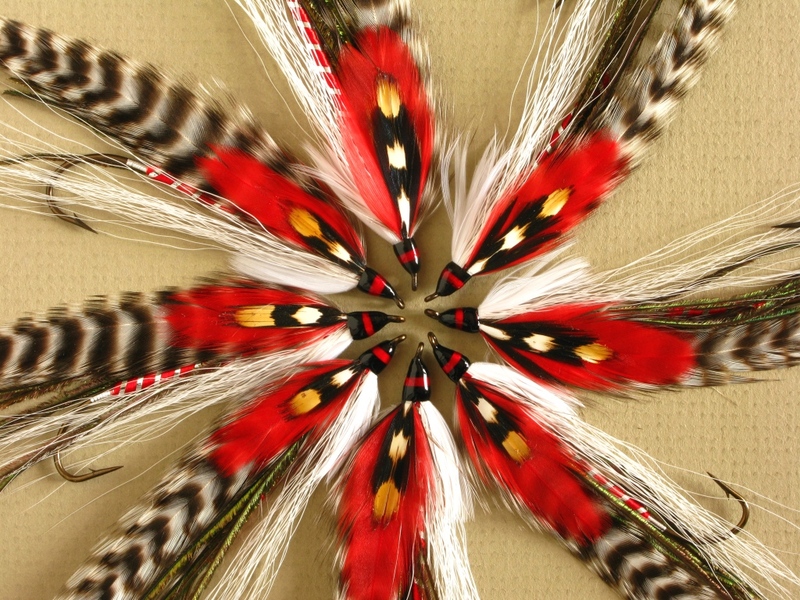 Shoulder: Duck breast feather dyed red (I used chicken – Whiting American Hen Cape). Nice and rounded, and I had the benefit of selecting them from the “file cabinet” of the cape. Shang's Favorite streamers - an eight-pack mix of hook sizes - #1 - 6x and 8x, and #2 - 8x. Shang's Favorite streamers - head-to-head. Four coats of head cement. Shang's Favorite streamers - Heads, shoulders, and cheeks...I believe the use of the banded head is a tribute to and in honor of Carrie Stevens, designating the patterns as being her original creations. This Collector’s Set No. 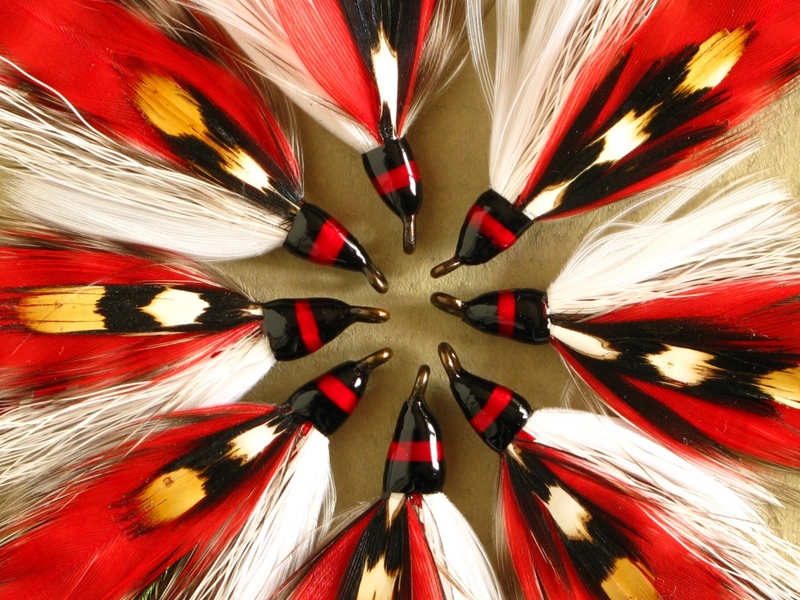 2 featuring the flies named after Charles E. “Shang” Wheeler are currently listed on MyFlies.com. 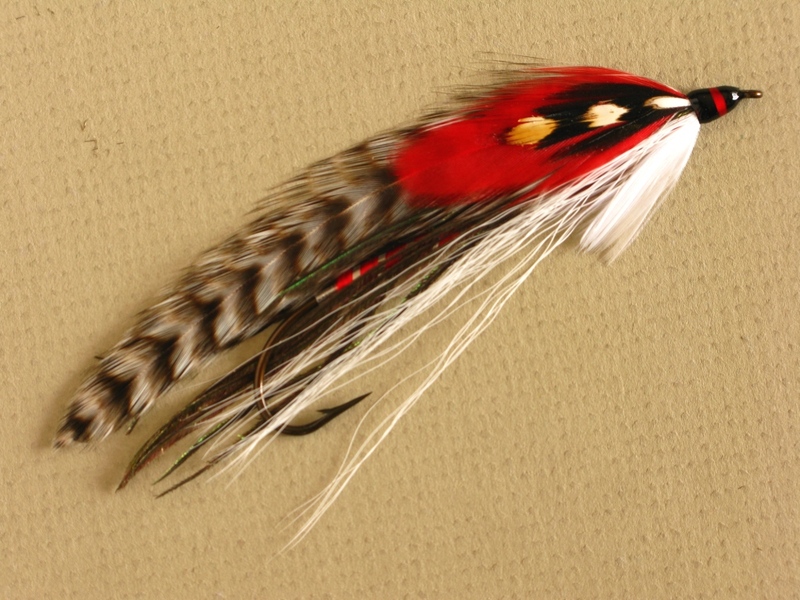 This entry was posted in A) - MyFlies.com, Fly Pattern Recipes, Streamers and Bucktails and tagged Carrie Stevens streamers, Don Bastian, MyFlies.com; Charles E. Wheeler, Shang's Favorite. Don, those are beauties. Since I discovered streamers365.com I’ve become totally enamored with the Rangeley Style streamers of Carrie Stevens. Another project added to the list. I have a question about the banded heads – do you complete the head in all black and then add the red band or do you tie them consecutively, black, red then black? Thanks! I barely posted these photos, you were like, waiting to pounce on the post! Like a cat after a bird! I mean that in a good way! Thank you very much! You are very observant — I used to do the heads in black and then add the red band. But head cement darkens the red into obscurity. 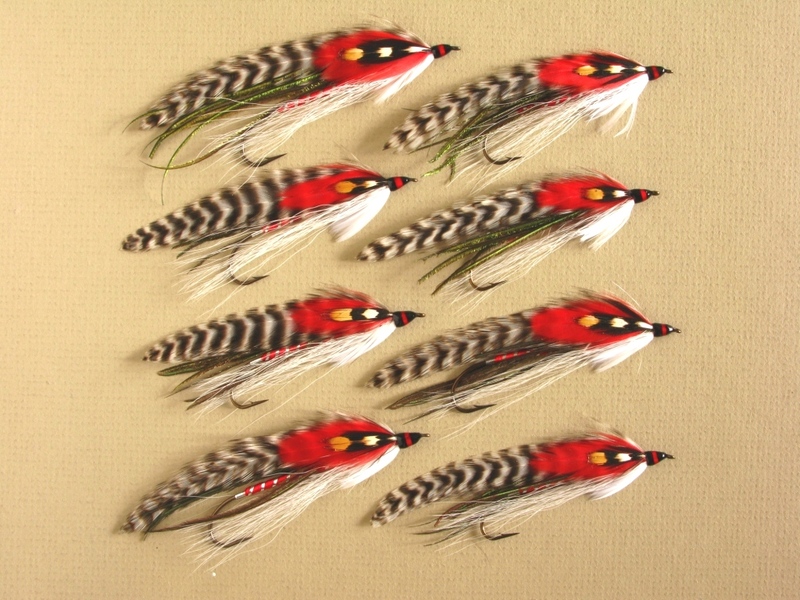 I use red Danville Flymaster 6/0 for attaching the wings, then build up the middle portion, flattening it for the finish, so there is a solid band of red. The the black is added fore and aft, flattening that as well, in two separate wraps and whip finishes. Thanks again for your compliments and comment! I found the exact problem you mentioned about darkening of the head when I experimented on a couple flies, so it seemed logical they were tied separately. Just thought I’d confirm my own suspicions, and you gave me a great tip for using the red at wing time! As for the pounce – I got the email through about your post and had a look. The flies really look good and I have virtually all materials to tie them (even the red hen cape), so maybe you’ll see some of my efforts posted soon somewhere! Don, these are magnificent flies. I love how your heads turn out right too. I struggle with the band. I am gonna try your method here, and see how it goes. Thank you Kelly! One could also use white thread for the head “foundation” and then finish off with the individual colors as necessary. I used to do that but now start with whatever color the band is, and use black only to finish them off. I have used white, then red on top…but mine didn’t come out like your’s do. You have the touch! Wonderful flies Don. It’s mesmerizing to see them all arranged in a circle as such. it reminds me of some of Jerome Molloy’s photos he took with dozens of his Atlantic Salmon flies arranged in an almost fractal image. Thank you, Darren! I appreciate your comment and your perspective view on these flies and photos. Thanks for the comparison to a professional too. Very pretty flies, Don. Elmer’s Rubber cement? Is that what I think it is? You can buy it in any store? Thank you Bruce! I am glad you like them. And yes, Elmer’s rubber cement, exactly what you think it is…I buy it at the hardware store down the road…Nice to hear from you! Just too nice not to share these Don. I hope you don’t mind that I put up a little post and link to your page. Thanks again for showing your wonderful work ! And don’t forget, that streamer is a very serious fish taker up here! Thank you for your input — I admit I never fished the Shang’s Favorite, but I’d like to. Hey, a great excuse to go fishing! Test out a “new” pattern…! Thanks for your comment, appreciate it! Will I see you in Brewer or Freeport next month? Those are phenomenal Don! Not just because I’m from the south either – red and grey just go great together and the way you have them displayed and photographed is exquisite and makes them shine! Thank you for your comment, and I appreciate your kind words of support. I am glad you like the flies and photo! Thanks!